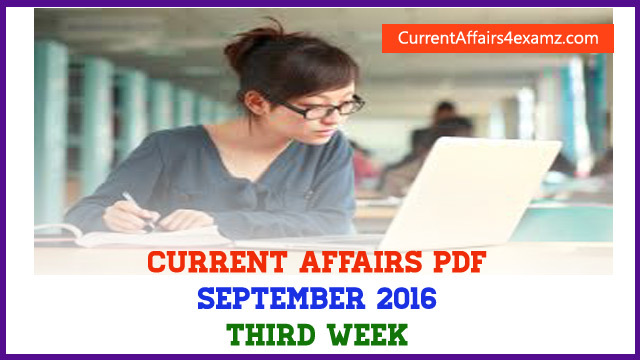 Hi Aspirants, in this post we bring you the Current Affairs PDF Capsule of September 2016 (Third Week). 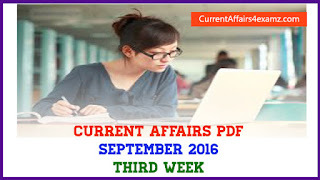 This PDF is completely free of cost which covers all the important current affair events of September 2016 (Third Week) that are important for banking, insurance, SSC, UPSC and other competitive exams. You can download the free current affairs September 2016 Pdf from the link below. 1. Who won the women's singles title of US Open 2016? 2. Name the winner of the 2016 US Open Men’s Singles title? 3. Mariyappan Thangavelu, who won gold medal at 2016 Rio Paralympics Games, is associated with which sports? 4. Deepa Malik, who won silver medal at Rio Paralympics 2016, is associated with which sports? 5. Name the Indian who was recently ranked second in Fortune’s ’50 Most Powerful Women International’ outside US? 6. Which team has won the inaugural day/night 2016-17 Duleep Trophy Cricket tournament? 7. Hindi Diwas is celebrated every year on? 8. Pushpa Kumar Dahal ‘Prachanda’ who arrived in India on 16 September 2016 is the Prime Minister of which country? 9. Who has recently become the first Indian star to enter the Forbes list of highest paid television actresses in the world? 10. International Day for the Preservation of the Ozone Layer is observed on? Check all the Important 70 Questions from the following PDF.